Do you ever look in the mirror and see a crazy maniac staring back at you? Do you like to read stories about kittens, puppies and ponies getting mashed and pulverised? Do you sometimes get the urge to take your clothes off and cover yourself in mud? Do you often waste your time taking crazy tests like this one? 3-5 Congratulations. You are completely crazy. You will love this book. 1-2 Congratulations. You are not far off completely crazy. You will love this book. 0 Congratulations. You are 100 per cent sane, normal and well adjusted. 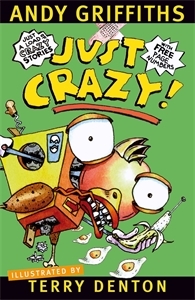 You must be crazy! You will love this book. Nine highly original, humorous stories complemented by imaginative and hilarious illustrations from one of Australia's most well-known and acclaimed illustrators, Terry Denton.